Probably this is part of the reason I can't always get a lot done. I know I am lucky to have a room to work in, and not just a corner of the dining room table like some people but I wish I was better at dealing with clutter. 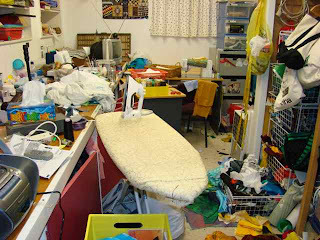 You could organise a 'clear the clutter party'. Invite 2 friends over, promise them a yummy afternoon tea and give them an hour. Then promise you'll do the same for them. Well, it might work!